Korg have historically not been very active in the stage piano field; at least at the more pro-oriented, expensive end of it. Their SV-1 ‘Stage Vintage Piano’ dates back to 2009, and though a worthwhile instrument (and still available) it’s inevitably showing its age. With competition as strong as it’s ever been in this market, a successor was clearly overdue. Enter the Grandstage. These are unashamedly premium offerings, with both 88- and 73-note versions having Korg’s best RH3 hammer action keyboard, their flagship sound-engine technologies and friendly front-panel behaviour. They come with accessories too, including a music desk, decent half-pedalling-capable damper pedal and (unusually) a full-size and quite elaborate stand. First, some physical characteristics. Casework is a mix of metal panels, plastic end cheeks and fibreboard base. The 88-note model weighs about 20kg, which is about as much as this reviewer can cope with (at least without loads of cursing). Build quality is good: everything fits together beautifully, there’s no creaking or twisting of the body, knobs are smooth and chunky, and rear-panel audio sockets are firmly anchored so that inserted plugs move very little. On the back there’s a proper IEC mains inlet, a momentary power switch, stereo audio outs on XLR as well as unbalanced quarter-inch jack sockets, inputs for three pedals (expression, switch and damper), DIN MIDI in/out, and USB Type A and B sockets. The Korg logo illuminates in a range of colours (not least a lurid pink), can cycle through them if you wish, and even vary intensity in response to key velocity. Modest souls will be relieved to hear that ‘Off’ is an option too. A headphone socket sits on the front left panel. The Grandstage’s rear panel includes an IEC mains port, USB A and B ports, MIDI I/O sockets, three quarter-inch jack footpedal inputs and stereo audio outputs on quarter-inch jack and XLR sockets. Simply put, the Grandstage lets you play either a single sound or two at a time (in a split or layer configuration), selected from front-panel sections marked ‘Keyboards’ and ‘Ensemble’. The marketing department line about ‘seven sound engines’ isn’t incorrect, but it refers to the various acoustic and analogue modelling and sample-replay technologies underpinning the soundset, rather than the number of timbres the Grandstage can generate concurrently. Back to those Keyboard and Ensembles sections on the top panel. It’s a bit counter-intuitive, but both have access to the exact same complement of 500 preset sounds, of which 170 are ‘keyboards’, and the other 330 non-keyboard ‘ensembles’. It makes a bit more sense when you notice that the main selector knob in the Keyboards section has ‘Ensemble’ as its last category, and vice versa. The knobs here are endless encoders, two of them surrounded by LED ‘petals’ that show their current value, and the other (marked ‘Variation’) allied to a little OLED display. Korg have done these before (on the KingKorg synth for one), and though small they’re very clear and informative. Exploring the sounds is just about as easy as you could wish for: twist the selector knob to the desired category, then use the Variation knob to spin through presets. Layers are achieved by just turning on both sound-producing sections, and for splits the Split button helpfully turns on the second layer if it wasn’t already activated. Holding it down and playing a key defines the split point. Need your two sounds the other way round? Just press ‘Swap’. All very simple, fast and intuitive. Having honed your setup it can be saved for eternity as a Favourite. Sixty-four slots are available, presented dead centre of the panel as eight-letter name banks, each with eight slot buttons. A good improvement on the old SV-1, certainly, which has eight slots in total. Although there’s no means of naming a Favourite it’d gain you very little, because the moment you select one, the front panel displays and knob-surrounds reveal what it consists of. Players juggling multiple musical projects can save and load sets of 64 favourites to and from a USB drive. There’s also the option to use a footswitch to advance sequentially through Favourites. I won’t beat around the bush: the Grandstage’s acoustic pianos are amongst the very best you’ll find in hardware form: impeccably presented, dynamic and musically rewarding, and with held note decays having complexity and life right down into silence. The SGX-2 sound engine apparently uses full-length stereo samples with 12 velocity layers. I couldn’t detect any velocity switching, and shifts of tone between neighbouring notes are no more pronounced than you might experience with a real piano. Performance is at the same sort of level as current market-leading computer sample libraries: pedal resonance sounds great, the playback engine supports non-pedal sympathetic resonance too, and there are subtle pedal noises. All in all, very impressive. Six main grands — Grandstage, Italian, German, Japanese, Berlin and Austrian — all have a ‘player’ stereo perspective (bass on left and treble on right) and individual character. The first three are the most contemporary sounding, immaculately presented, clean, and with a close-recorded presence and focus. ‘Austrian’ is somehow more spacious and laid back, while ‘Berlin’ is leaner, more woody, and capable of real delicacy. It was only ‘German’ that I personally didn’t click with. You might expect a Steinway to have a strident and domineering character, but this one is downright thuggish at the highest dynamic levels for notes just around middle C.
The two uprights are interesting. The first is a typical small domestic instrument, eager and full in the middle, becoming clunky and inharmonic in the bottom octaves. The second is bigger and more sophisticated, with a more coherent bass. There’s some room sound in its capture, though, and it can sound a bit artificial under close scrutiny. The top octave gets weirdly thin, and some low notes have a looped decay phase, kicking in after about three seconds. Even so, these are both good alternatives to the flagship grands, for some jobs. Electric pianos are driven by Korg’s modelling EP-1 sound engine. You get a Mark I, II, V, and some sort of Dyno-modded Rhodes; a Wurlitzer 200; Hohner Pianet; and a Yamaha electric grand. The sound and playing experience with these is absolutely first-class, and the Mark I’s progression from bell to bark through the velocity range is really phenomenal. In fact, all the Rhodes offer a tremendous feeling of almost tangible presence, supported by authentic note-off clatter. The Wurlitzer also sounds authentic, elastic, inevitably a bit less complex. The Yamaha is curious, though; its main preset has a loose, pseudo-stereo presentation even with no other effects activated. It also sounds like a CP70 or 80 plus another sound, with out-of-tune elements in the bass beyond the inherent inharmonicity. Some variations (see the ‘Variations’ box) of it are much better and cleaner. I’ll gloss over the ‘EP SYN’ sound category, and just say that if you need Yamaha DX-style electric pianos you’ll find them here, in all their plasticky and surprisingly expressive glory. There are also analogue-era electronic pianos, and some electric/synth hybrids. They’re all more than fit for purpose. The Clavinet provision offers all four (hooray!) of the real thing’s rocker-tab tone options. The main presets are appropriately mono, and once again there’s a strong mechanical element in the sound: initial attacks are deceptively complex, a few keys have dirty releases, and there’s key and case noise buried in there too. After the clavinets a couple of harpsichords lurk in the shadows, and are typical mid-20th Century monstrosities: terrible for baroque music, brilliant for halloween gigs. And that gets us to the organs, which are modelled after tonewheel (Korg’s own CX-3), Vox, Farfisa and a few wind-blown originals. Of course, it’s never going to be very satisfactory playing organ sounds from a hammer-action keyboard, and there’s no disguising the fact that the Grandstage has no drawbars or rocker tabs: you’re pretty much stuck with the preset registrations on offer. But having said that, there’s lots to like. The Grandstage 88’s front panel measures 131 x 36cm. The Hammond sounds have gobs of character, and they hum, click, swirl and snarl with the best of them. The Grandstage’s pitch wheel does duty here as a Leslie speaker rotation speed switch — a great design choice — and the real-time switches add vibrato and/or chorus. Percussion is also accurately modelled, in the sense that its intensity dissipates as new notes are played against held ones. I suspect that for 99 percent of gigging players there’s all the Hammond action here they’ll ever need: especially as you can lay out a group of related registrations as favourites, and enjoy seamless switching between them. The ‘Whiter Shade Of Pale’ climax can certainly be done, anyhow, so what more is there to say? Transistor organs are excellent too. The Vox ought to be good — Korg own the brand — and it really is: ballsy and rowdy. Likewise, the Farfisa has a fruity string-machine quality that is instantly evocative. Of the remaining instruments in the Organ category there’s some useful Italian and French squeezeboxes, but the main ‘Accordion’ sound has a ping-pong delay effect baked into it that must surely be a programming mistake. Also, the pipe organs are for my money all too big, too gothic, and only like a parody of the real thing: good for Count Dracula skits maybe. Some attractive, quieter flute and reed combinations are sorely missed. Amongst the Ensemble sound categories, Strings are very nice on the whole: sweet and clear, and attractive without needing to be doused in chorus and reverb. There’s a decent variety too, from symphonic washes to agile studio sections and quartets. Some Mellotron banks add to the fun and respect the eight-second original duration (give or take a bit for sample mapping). A variety of synth pads, string machines, choirs and Fairlight ‘oohs’ get lumped into this category and there’s some great stuff, covering a lot of bases. It’s a similar picture with Brass. A few sounds, like a great Harmon mute trumpet section, and ‘SFZ Brass’ (Steely Dan tribute players rejoice), are absolute belters. Some wind sounds that live here offer multiple articulations from the SW1 and SW2 panel switches. There’s also a very good sax, and a remarkable harmonica that, played carefully, sounds just like the real thing. Synth and Lead categories will get you safely in and out of ‘Wish You Were Here’, ‘Jump’, ‘Africa’, ‘Here Comes The Sun’ and ‘Get Lucky’. There’s some straightforward PolySix-style pads, creamy Moog tones, and a nice Sequential tribute ‘Sawyer Lead’. This and many other leads are monophonic, by the way. The remaining Bells, Guitars, Bass, and SFX/Hit sounds are pretty much as you might expect. Some acoustic, often quite convincing when played appropriately, and some synthetic, largely upholding the quality that’s found elsewhere in the soundset. Notably, there are no drums at all. Like the rest of the instrument, the Reverb/Delay is straightforward and friendly. Four reverbs and four delays are on offer, and a Depth encoder adjusts dry/wet balance (and also feedback level, apparently, for the Tape delay algorithm, right up to an everlasting unity). A time-tap button is the only way to set delay times, apparently up to about 2.5 seconds. The naturalistic reverbs are largely free of ringing, and have preset decays of about 3.5, 2 and 0.3 seconds respectively, from Hall to Room. The mono Spring reverb is excellent, working a treat on the electric organ sounds. Tape delay is also good: mono, smeary and lo-fi. Only the straightforward echo-like Delay actually preserves the original pan characteristics of the stereo pianos. Reverb and Delay settings outlast manual sound selections, incidentally, but can be saved to (and recalled as part of) a Favourite. The same can’t be said for the on-board three-band EQ, which is a proper global-level widget. The boosts and cuts it applies are obvious enough, but soft-edged: literally, the frequency bands have gentle roll-off characteristics. Good for subtle tone shifts, and adapting the Grandstage to different PAs, and not so good for piano-down-a-telephone-line effects. The Dynamics section is also a global level thing, unaffected by Favourite recall. But what exactly is it? A compressor? Actually it seems to skew the currently selected velocity curve (there are nine of those, incidentally) and perhaps also modifies the dynamic range of sound playback in response to velocity. Twist the knob one way and things feel louder and more responsive. The other, more delicate, with a wider dynamic range. In a band or ensemble situation where you feel your more subtle contributions are getting masked by what’s going on around you, a clockwise Dynamics twist will bring them up in the mix without affecting your peak levels. It’s a brilliant feature, miles more useful than a conventional compressor (and don’t even get me started on phoney valve output stages...). 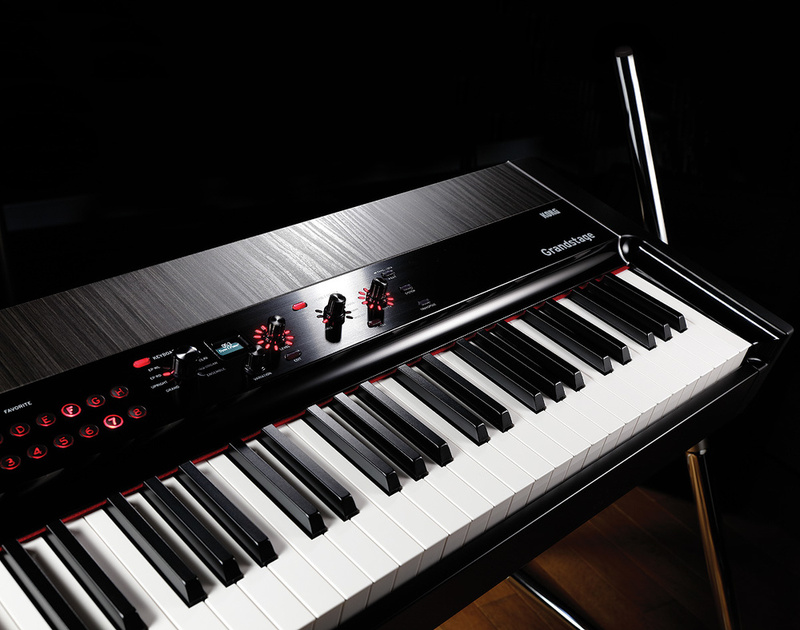 The velocity shifts make it to the MIDI output too, so Dynamics has a useful role in master keyboard functionality. If there’s one thing that Nord have taught us over the years, it’s that usability and vibe count for more than bewildering feature sets. Korg seem to have taken this on board with the Grandstage: here’s a keyboard which, though straightforward, is actually very desirable. It gets the important things right. During the review period, I personally loved having the Grandstage around. It felt rewarding and exciting to play, providing solutions rather than posing problems. The exact balance of features is crucial here: the emphasis on first-class piano sounds, but with great-sounding organs, synths and strings that many players regularly need on hand. The Smooth Sound Transitions, Dynamics knob, and even the provision of a strong metal music rest all count for a lot. I could see the Grandstage stealing some of Roland’s RD market because of its greater ease of use, while also poaching Nord Piano sales because of the generally broader scope (not to mention the pitch and mod wheels). The list of things I didn’t like is quite short. I’ve mentioned a few reservations about specific sounds already. Another is the 38-second boot-up time: a first-world problem if there ever was one, but a bit of a passion-killer sometimes. MIDI controller features are little more than rudimentary: keys, wheels and pedals, but no knobs or sliders for CC messages. Simultaneous delay and reverb would have been a nice option. The stand is a bit silly too, and I’m pretty sure many users would have taken a lower purchase price instead. Which raises the wider question of cost, relative to some other things on the market. Everything considered though, the Grandstage is a cracking stage piano. An all-rounder, yes, but you might fall in love with it too. It’s no coincidence that the Grandstage costs almost exactly the same as the Nord Piano 3. That keyboard wins out in the even greater scope of its piano library and more configurable effects, but loses to the Korg in the breadth and quality of its other sounds, and the lack of pitch and mod wheels. Roland’s RD-2000 is the same money too, and has considerably more bells and whistles, as well as a different set of flagship technologies. It offers much more in the way of real-time control, including over its organ sounds, but approaches workstation levels of complexity in some areas. As I mentioned before, the Grandstage has 500 preset sounds. In the Keyboard categories, though, a lot of these are variations of a much smaller number of main sounds. For example, the six acoustic grands spawn 35 sounds in total, including mono, compressed, chorused and ‘Flat Tune’ variations, as well as some ‘Dark’ and ‘Bright’ versions that rejig the velocity mapping. Likewise, the electric pianos come with phasers, rotary speakers, auto and pedal-driven wah, distortion and so on. Many variations are super-useful, like the Dark version of the Steinway, which to my ear is much preferable to the main preset. I don’t buy the mono pianos, though; they appear to be the standard stereo sounds folded to one channel, and lack the focus of a true mono capture. Many variations rely on preset-level effects processing that’s entirely independent from the front-panel Reverb/Delay effects, and have further tone or effect options toggled from the SW1 and SW2 switches. Korg obviously took the view that it’d be better to bake treatments into the presets rather than fully liberate the separate processors (as on, say, the Nord piano). It’s not a bad approach and works well, not least because the effects are of high quality across the board, and the starting point settings aren’t overdone. But what if you do want to cook up a unique sound? A range of additional parameters, which vary from sound to sound, lurk behind the front-panel Edit buttons. You can always adjust Octave, (fine) Tune and Release time (in the ADSR synth sense), and also the send level to the front-panel Reverb/Delay and whether the damper pedal functions or not (which comes into its own for splits and layers). Acoustic pianos can additionally have their sympathetic resonance level adjusted: by default it’s (bizarrely) turned off. Sounds with ready-rolled effects might also present a few parameters for them here too. It’s all useful and quick, but not especially deep, and you’ll search in vain for options to alter piano lid position, stereo perspective, or an electric piano’s pickup behaviour. As for the per-note adjustments that the latest Roland RDs can do, forget it. What you can tweak can form part of a Favourite, but can never replace Korg’s original preset. The RH3 hammer action has been around for a while. It offers velocity but not aftertouch sensitivity, white keys are smooth and glossy, black keys matt and lightly textured, and though Korg don’t mention it, there is something akin to Roland’s escapement notch on the downstroke. Nothing like as pronounced, but certainly a slight increase in load after about 5mm. The key dip is a relatively shallow 9mm (compared to most acoustic grands’ 10mm) but the bed will absorb another 3mm of downward pressure. It’s a fairly quiet action, with a dry key-down thud, and a similar but quieter release, with little or no case resonance. My own subjective opinion is that this is one of the best actions available at the moment: fast and responsive, and with an end of stroke that’s communicative but also plush. The shallow dip is a good compromise for acoustic and electric piano playing, there’s none of the hollow coarseness that typifies the very cheapest hammer actions, nor the repetition-swallowing sogginess of many mid-range keybeds (not least several Fatar models). By the way, all sounds play over the entire 88- or 73-note range, whether the originals did that or not. That makes for some ludicrous electric piano and guitar pitch extremes, but it’s no doubt the least bad solution to a practical problem. 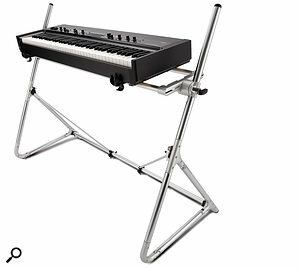 A stand comes bundled with the Grandstage: the so-called M-SV. It’s a funky affair, with a shelf supported between two tubular chrome end-frames. Korg’s claim that it matches the Grandstage is up for debate, I’d say. I also question its road-worthiness: it consists of at least six separate elements, has plastic components and bicycle-style quick-release levers in several places, and packs down neither small nor easily. However, additional shelves seem to be available for it, and it might well make for an interesting feature in a permanent studio installation. It’s certainly sturdy, when all set up. 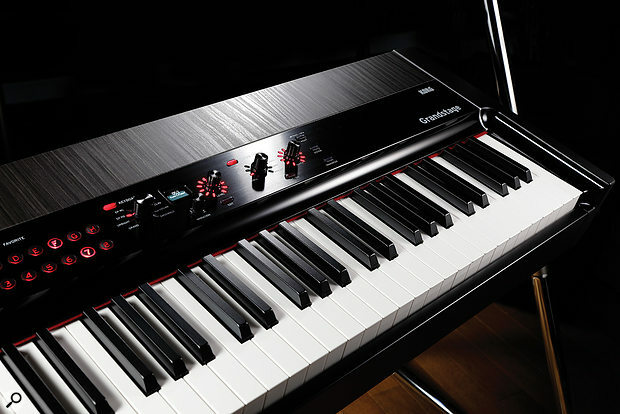 Some of the best acoustic and electric pianos currently available in hardware form. Easy to use and musically rewarding, the Grandstage is a deceptively powerful gigging tool that puts Korg back at the top of the stage piano game. Grandstage 88 £2349, Grandstage 73 £2249. Prices include VAT. Grandstage 88 $2499, Grandstage 73 $2299.